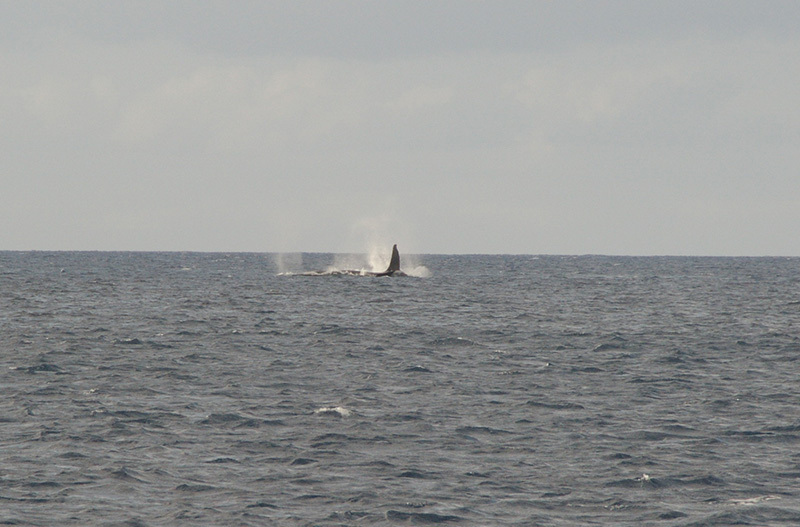 Our time in Tonga was punctuated with joy and sorrow. We met for the first time the beautiful people of the Kingdom of Tonga and were exposed to a new culture in a developing nation. We had more time to explore a country than we usually do before rushing off to the next one, because we had a month to wait until the weather was good enough for the passage to New Zealand. We caught up with the rest of the American fleet, which had preceded us all the way across the South Pacific, and met crews we hadn’t seen since La Paz, Mexico. We reunited with old friends and made some new ones. But the cloud shadow of a family tragedy darkened what would have been an otherwise sunny time and made me anxious to leave for New Zealand, where we would leave the boat in Patrick’s care for the beginning of cyclone season and I would catch a flight home. We waited patiently for a weather window in which to make the passage. After a month in Tonga, it was time to say our farewells. We planned to head south to the Ha’apai Group to position ourselves further along the route and to take advantage of the next opportunity (after a passing low) to set course for New Zealand. 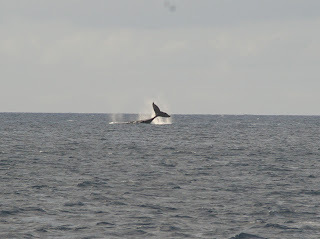 As we left the Vava’u Group, a humpback whale breached twice in front of the boat! 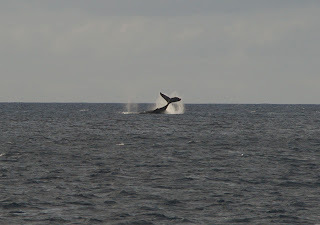 During our month in Tonga, we had seen half a dozen humpbacks, but they were always underway and not putting on a display. 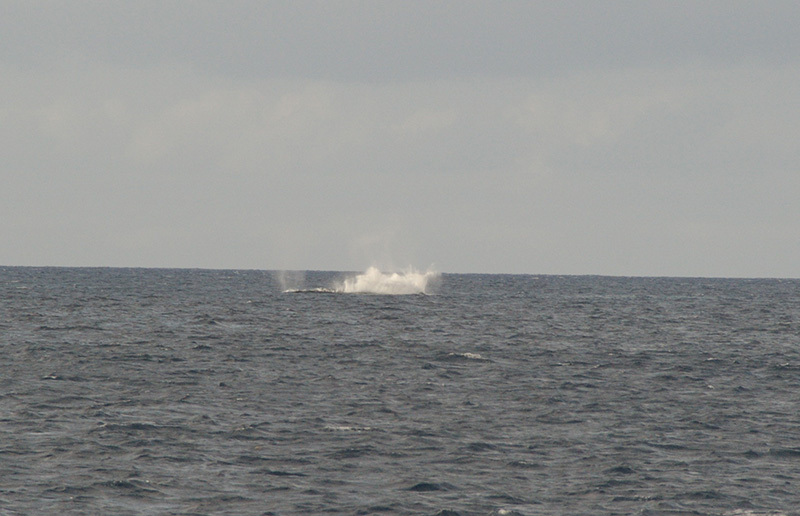 We didn’t have our cameras at the ready for the breaching humpback, but took some pictures of its later show of tail slapping behavior. 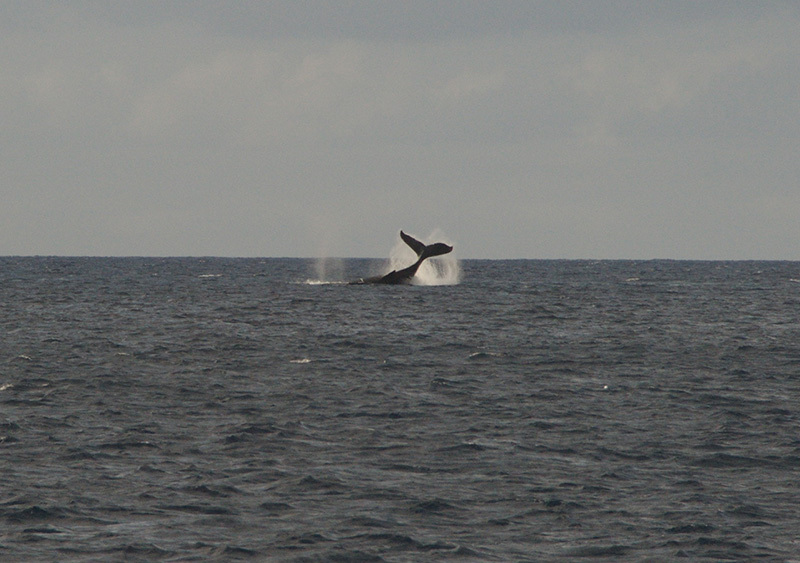 The humpback was Vava’u’s farewell gift to us. Due to the high winds accompanying the tropical depression, we spent our time in the Ha’apai weather bound and confined to the boat. 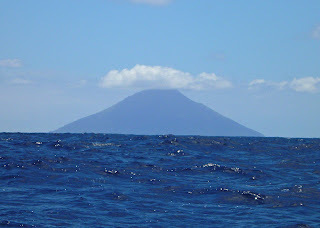 We were unable to explore the active volcano at Tofua Island or snorkel in the area. After the cyclone passed, a weather window opened up for the passage to New Zealand; so we spent a day in the village running errands and left on passage the next day. Riding in the dinghy at sunrise on the morning we pulled anchor, headed for a last trip to the Saturday market, I was overwhelmed by the smell of frangipani and became acutely aware that we were leaving the tropics. 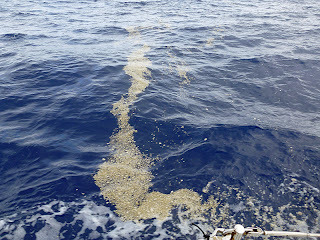 By the time we returned to the boat, the frequently encountered smell of burning palm fronds---another smell I associate with the tropics---had replaced the fragrant scent of frangipani. Shortly after clearing the harbor, we passed a huge sea turtle swimming along in the opposite direction of Silhouette. The passage continued in this vein, with the sea presenting its remembrances like the breaching whale and the sea turtle. It was as if the sea was aware that this was our last passage for many months and was trying to pack all its gifts and glory into one voyage. 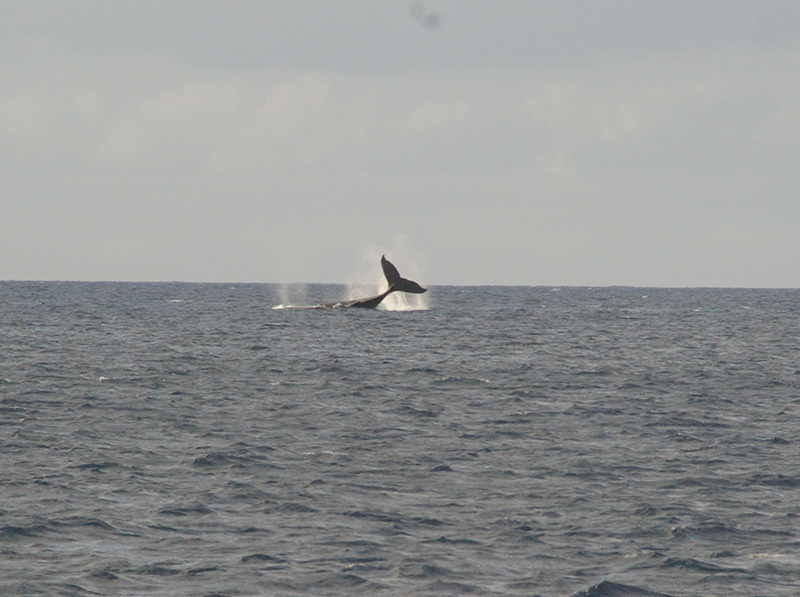 Dolphin graced our bow for the first time since the Marquesas, and a school of fish ran with the boat under our hull. Flying fish made flights of epic length by day, and meteors arced through the skies by night. The rainbows were all double-rainbows. Silhouette scattered bioluminescent organisms from her bow wave like sparks from a blacksmith’s forge. Yet the sea, always one to play her cards close to the chest, also continued to offer up new mysteries. We began to travel through fields of pumice, leftover extrusions from a volcanic eruption. 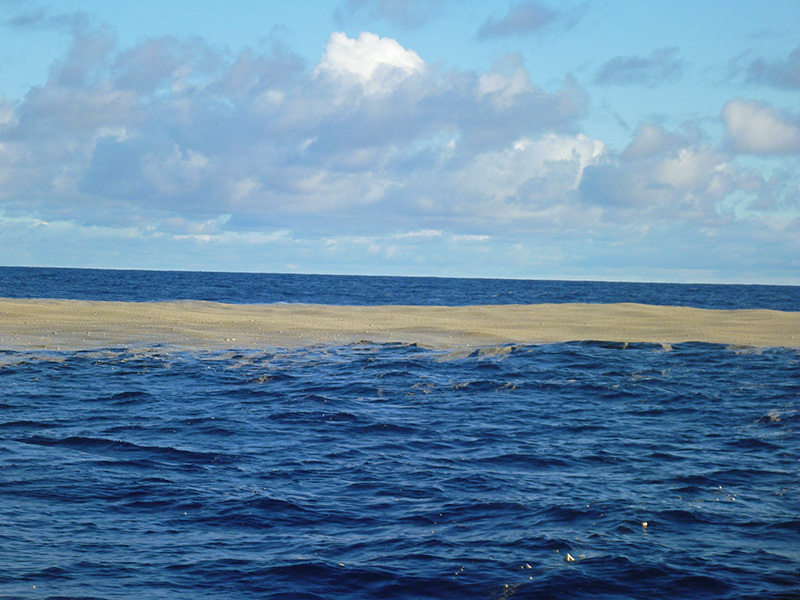 Tonga, in particular, is very tectonically active, as it is located along plate boundaries. (We had earlier experienced a 5.5 magnitude earthquake, whose epicenter was only 28 miles away, while moored at Lape Island. 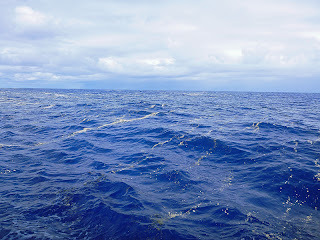 Usually, you can’t feel an earthquake while at sea; but since we were attached to the bottom through the ground tackle of the mooring, I could clearly feel the earthquake that morning.) 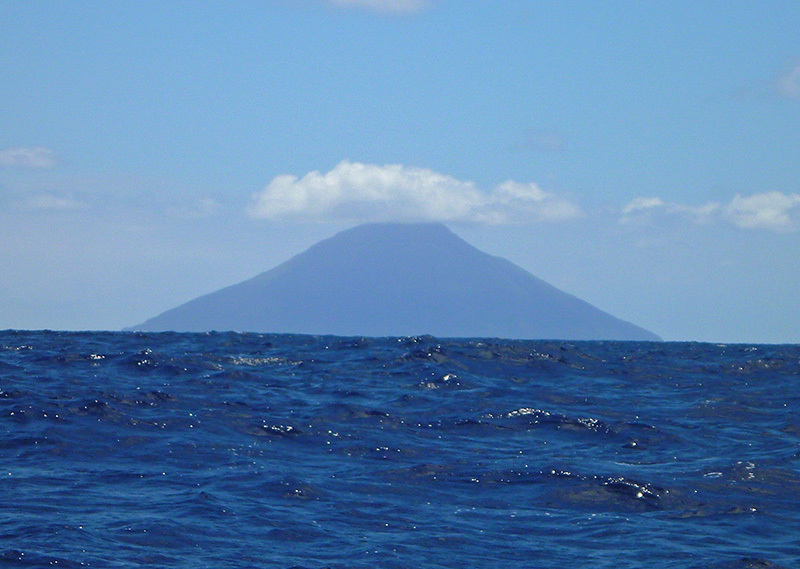 Along with earthquakes, Tonga is subject to frequent volcanic activity, and reports of new volcanic islands being created and then eroding back into the sea almost as quickly through wave action are not uncommon. 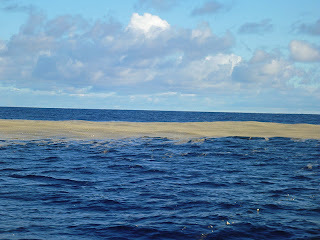 The pumice we were seeing now was most likely from a recent undersea eruption http://earthobservatory.nasa.gov/NaturalHazards/view.php?id=78849. It occurred in vast patches from latitude 19 degrees to latitude 33 degrees and varied in size from coarse, cat litter-sized particles to chunks the size of small boulders. 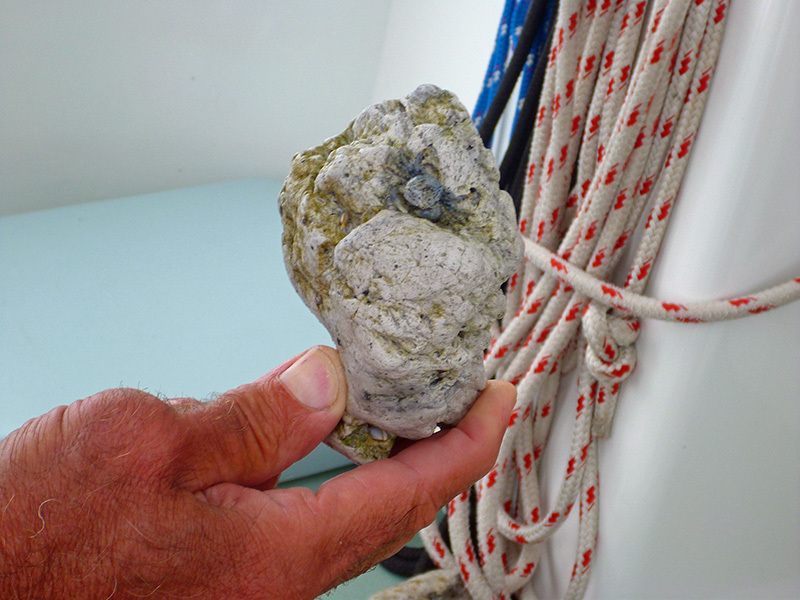 Patrick and I collected some fist-sized pieces of pumice as it passed by the boat. Each miniature floating island was a microcosm! 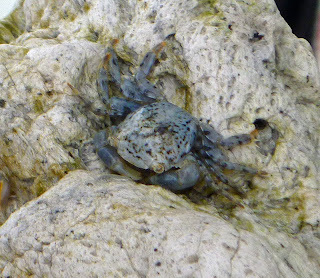 We discovered gooseneck barnacles, tube worms, and diminutive crabs inhabiting their barren volcanic tracts. Tenacious life was everywhere! When I think of the journey those pumice stones took---thrust out of the magma chamber of a volcano in a violent explosion, cooling immediately upon contact with the seawater, drifting wherever the ocean currents carried them, and finally being colonized by minute planktonic larvae, some of which survived to adulthood---I am stupefied. And as for the sea life: how did these tiny creatures, alive and well on a floating piece of pumice no bigger than my hand, survive the tropical depression that inflicted injury upon so many vessels of larger dimensions? 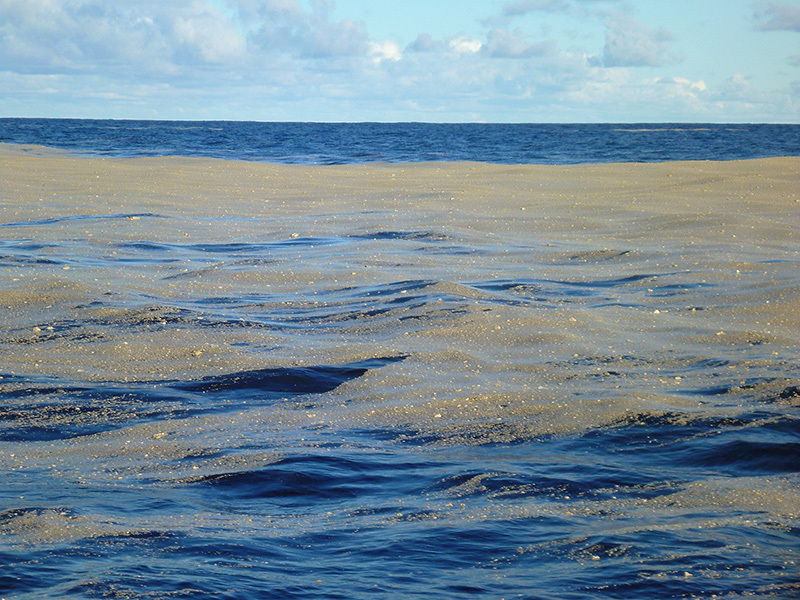 As the degrees of latitude ticked off, we became aware of how startingly cool the water felt when we trailed our hands over the side or ran the seawater pump---just as, months ago, we were amazed by the warmth of the tropical sea after the hypothermia-inducing waters of the Pacific Northwest. Nights in the cockpit began to see us wearing more layers, gradually bringing out the fleece, lightweight rain gear, and finally, full foul weather gear, hats, and gloves. I still wore shorts during the day up until the last three days of the passage (which were overcast, windy, and damp), but I traded tank tops for T-shirts and was no longer continually bathed in sweat. It was a relief to be cool again. The sunny, yet brisk days on passage reminded me of summer in Puget Sound. Since our Pactor modem is defunct and we couldn’t get weather reports in the format we like most, we spent a lot more time on this passage listening to the radio than we usually do. Another reason for more time spent on frequency was because we were in proximity to many boats making the same passage at the same time, another first for us. 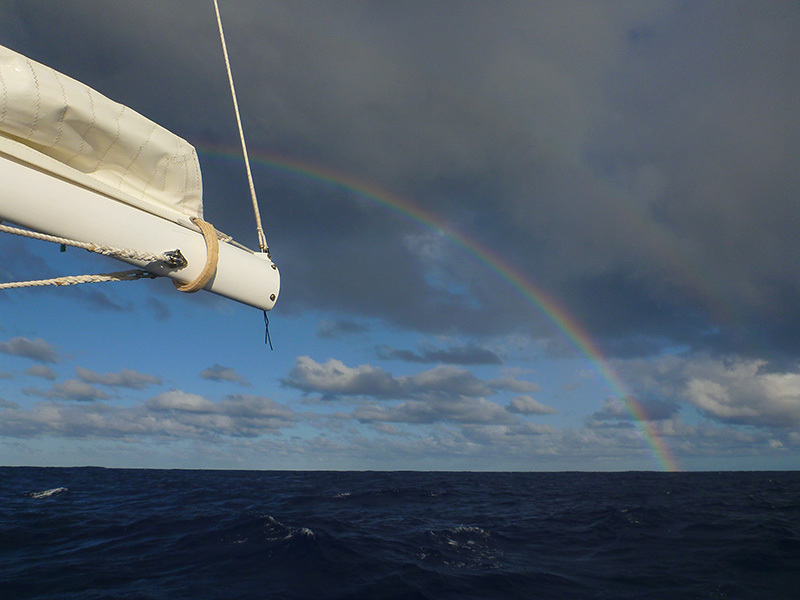 We tuned into Gulf Harbor Radio out of New Zealand, hosted by David and Patricia from S/V Chameleon, for the passage weather report each morning. (David is a meteorologist.) 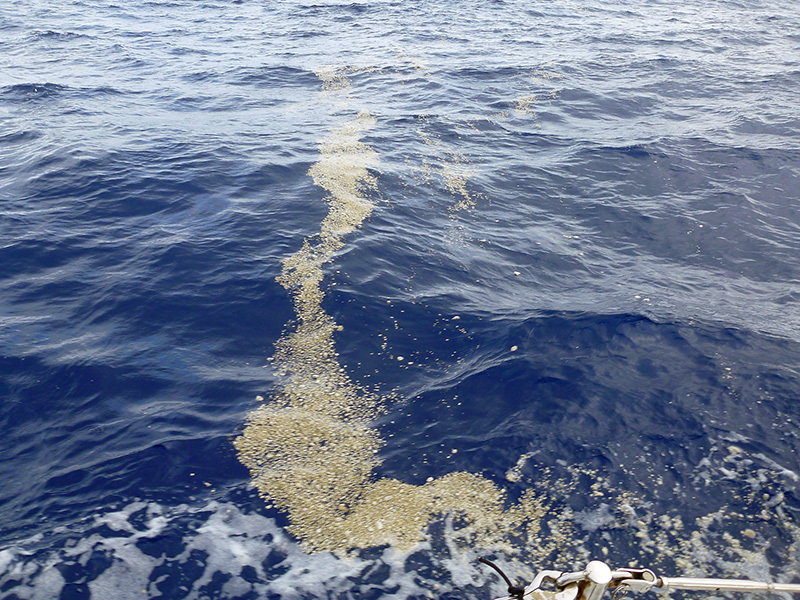 We reported our position in the late afternoon on the Pacific Seafarer’s Net. We tuned in to the Drifter’s Net in the morning and evening to monitor the positions of other boats around us and to find out what the weather was like up ahead. News of other crews experiencing their own cloud shadows reached us both before departing Neiafu and during the journey. When we arrived in Neiafu, we were puzzled as to why our friends Jim and Karen’s boat, Sockdolager, was on a mooring buoy in the harbor, while they were nowhere to be seen. We later learned that Karen had been experiencing heart palpitations and, after a nightmarish evaluation in a hospital in Nuku’Alofa, flew to New Zealand for further tests and treatment. Jim accompanied her but later returned to Neiafu to retrieve Sockdolager. He will bring the boat to New Zealand with a close friend accompanying him as crew. Karen and Jim have published their story on their own blog. I have intentionally omitted the boat and crew names from most of the other incidents recounted here in order to protect peoples’ privacy. One skipper’s mother passed away, and he had to fly home to New Zealand for the funeral, leaving his wife and daughter with the boat in Neiafu. He flew back to Tonga after the funeral, only to turn towards New Zealand a second time, this time under sail. On another vessel, the skipper suffered a heart attack. Poignantly, he died at sea just before reaching his intended destination of Auckland. When we were about halfway to New Zealand, we heard the report of another casualty on a boat that had run aground on a reef back in the Vava’u Group. The body was badly decomposed, and authorities found 200 kg of cocaine with an Australian street value of $116 million onboard. There were some other silver linings. Adventure Bound, the vessel that responded to the aid of the crew in distress, finally made it safely to Opua and received a hero’s welcome from the members of the boating community assembled there. The crew of Moonwalker sailed into the Bay of Islands and their home country for the first time in six years after completing a circumnavigation. Patrick and I heard most of these stories over the radio as we were on our way to New Zealand. On this passage that is notorious for having too much wind, our problem---as well as that of the other boats traveling at the same time---was that there was too little. Patrick and I chose to do whatever it took to keep the boat moving, so that we could arrive in New Zealand before the next predicted low. 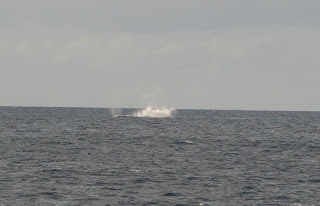 Based on our accumulated engine hours, we motored or motor sailed a total of four days out of an eleven day passage. 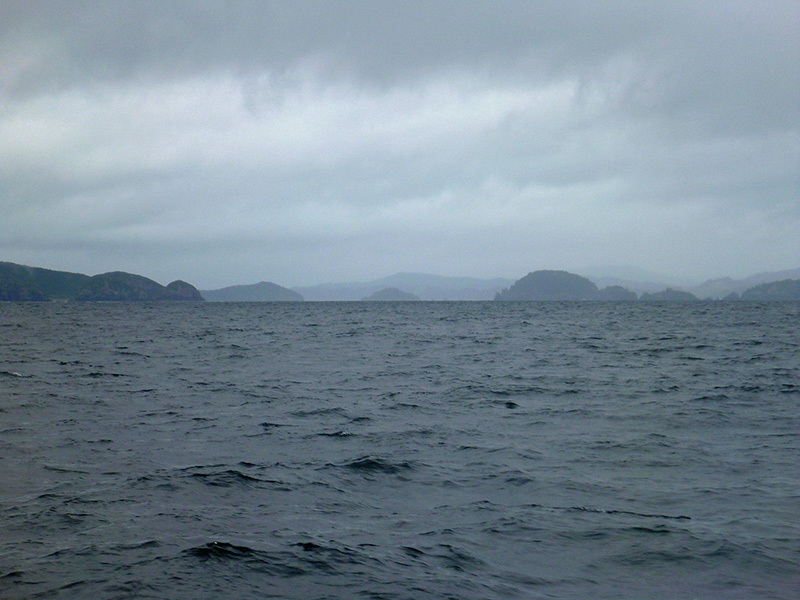 Our passage remained without incident until the day before we arrived in the Bay of Islands. The weather had turned cloudy and rainy, and the wind and sea conditions had picked up. During the last 36 hours of our trip, we had sustained winds of over twenty knots a good portion of the time and 3-4 meter seas. 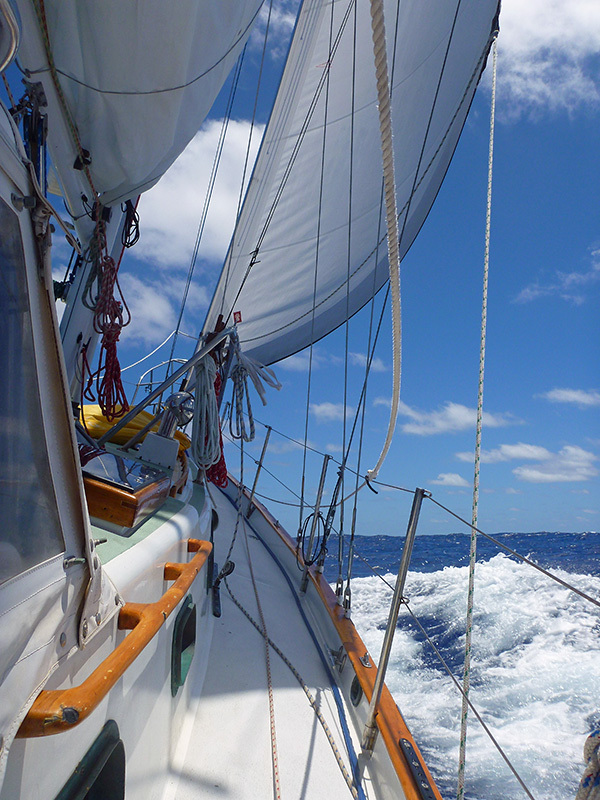 The wind during our last few days on passage had been from a favorable northeast direction, and at one point, we went from a double-reefed main and staysail down to just the staysail because the boat was going so fast. 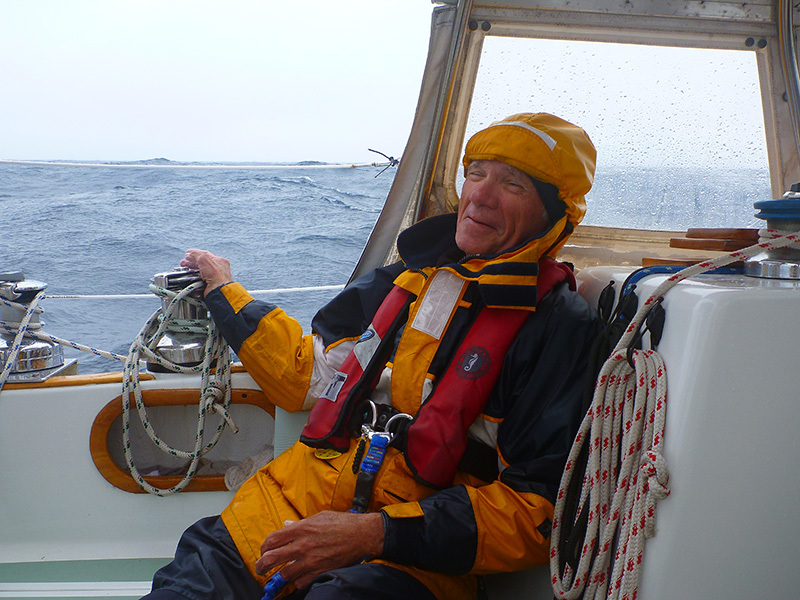 During the afternoon, the wind had clocked around to the southeast, so that we were beating to weather on our course to New Zealand in winds over twenty knots. We forewent our usual watch schedule on our last night at sea, each taking only a brief nap, so that we could both be on deck for sail changes and boat handling. 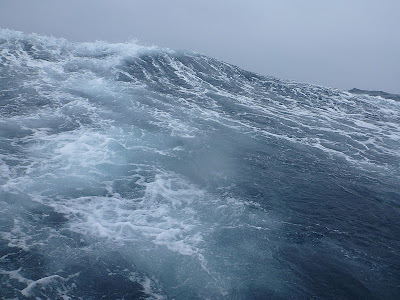 Our forward progress became so slow, and the boat was pounding into the seas so jarringly, that in lieu of stopping and heaving to, we decided to motor sail in order to keep going. We started the engine and continued ahead. Suddenly, the engine died. We figured that the fuel pick-up line might have gotten clogged again (which turned out to be the problem the last two times the engine stalled), and Patrick switched to the other fuel tank. The engine started temporarily, and then died again. I took the helm, while Patrick started troubleshooting the engine problem. With the erratic motion of the boat and the rolling sea, he thought that air may have gotten into the pick-up line, causing the engine to stall, so he began to bleed the engine. The bleeding screw from the top of the fuel injector pump broke off when Patrick (hanging upside down over the engine in a rolling three meter sea) tried to loosen it with a long wrench. Now there was no way we could run the engine without squirting diesel all over, so we realized that we were going to have to complete our voyage without an engine. 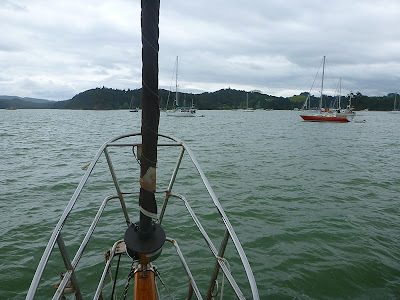 With the wind we were having, it was not going to be a problem getting to New Zealand, but we were concerned about navigating the channel into Opua in the dark without an engine. As it turned out, we didn’t arrive until dawn due to our slow progress beating south. 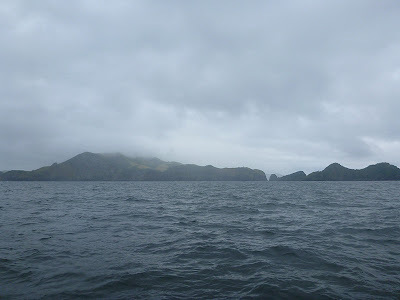 As we entered the Bay of Islands, the wind dropped to seven knots or less, and we despaired of losing it entirely and being stalled so close to our goal. Soon it rose back to 12-14 knots and we were making our way down the channel. 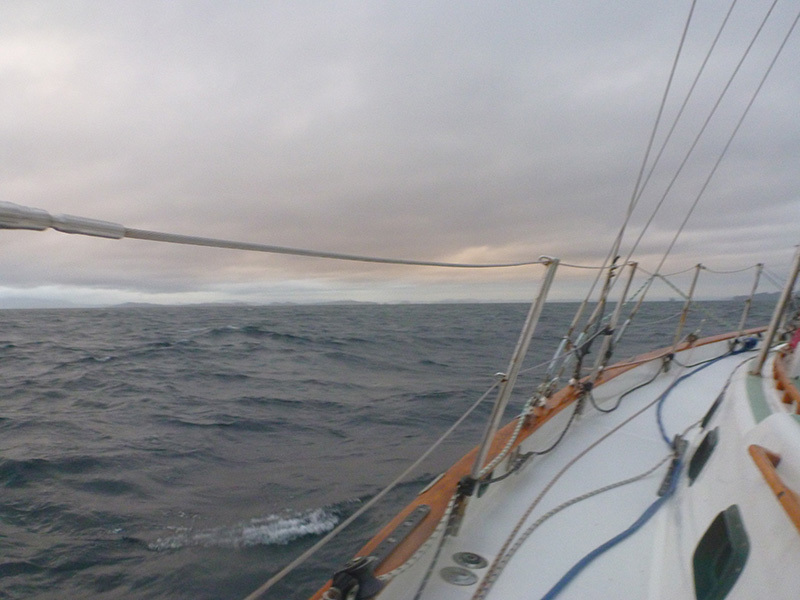 Once we arrived at the narrowest part of the channel, the wind dropped again. We were hailed over the radio by Tevakenui, who was entering the bay behind us, and generously offered a tow. We wanted to continue under our own power and gratefully declined. 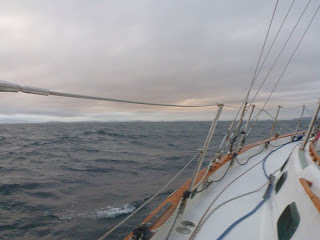 By now, the wind had dropped again, and we completed our passage ghosting along under the main and staysail. Patrick steered, while I operated the sheets and traveler as we short-tacked down the narrow channel toward the “Q” (quarantine) dock. Patrick had been concerned about how he was going to bring Silhouette alongside the dock without an engine (we don’t have a steering oar onboard), but earlier that morning, David from Gulf Harbor Radio gave us a suggestion. He suggested it was possible to call Customs and ask permission to drop anchor near the Q dock instead of docking, and that they would send a dinghy out to clear the boat. This turned out to be what happened, and it saved us a lot of stress and worry. We weaved our way in and out of the boats at anchor until we were able to come alongside the Q dock, then dropped our anchor while under sail. From the dock, we heard a small burst of applause, and looked over to see the crews of Kindred Spirit and Tevakenui. Both vessels had entered the Bay of Islands after us, but both boats reached the Customs dock before us. It was wonderful to receive this warm welcome after the last tiring 36 hours. 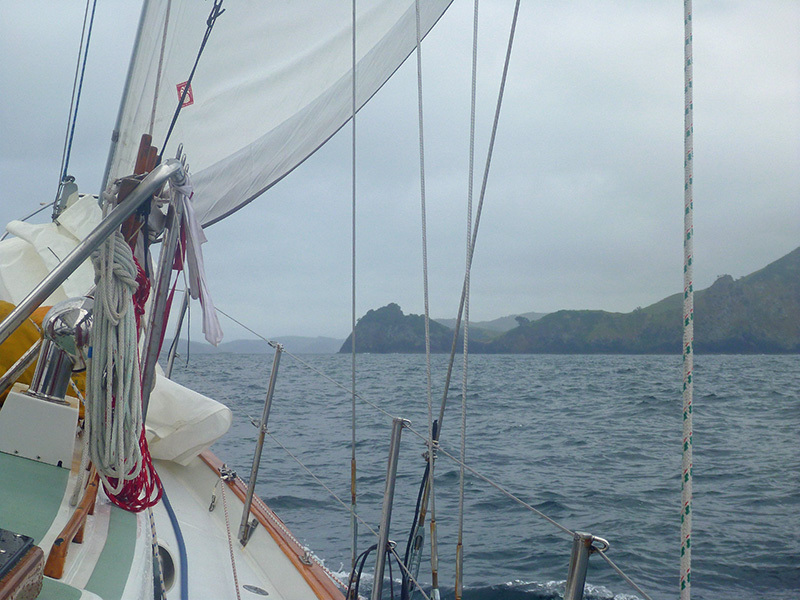 It had taken as long to travel the last 25 miles to the Bay of Islands and to tack into it as it did to sail the preceding 75 miles before that! But we weren’t done yet. The Customs and Biosecurity clearances were quick and painless (except for giving up some beautiful fresh tomatoes, which the rough weather had prevented me from turning into spaghetti sauce), but then we had to sail off the anchor. We couldn’t remain where we were, in the channel used by boats coming alongside the Q dock, and had to find a spot in the anchorage. 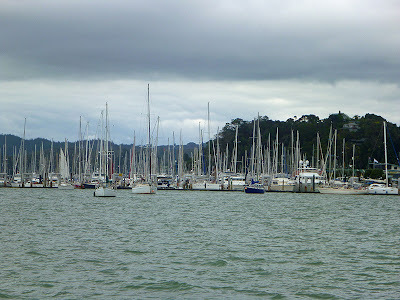 We had planned to stay in the marina for our first week in Opua, but the broken engine precluded that. We sailed off the anchor without incident and soon set the hook in the mud of one of the many yacht mooring areas in the Bay of Islands. 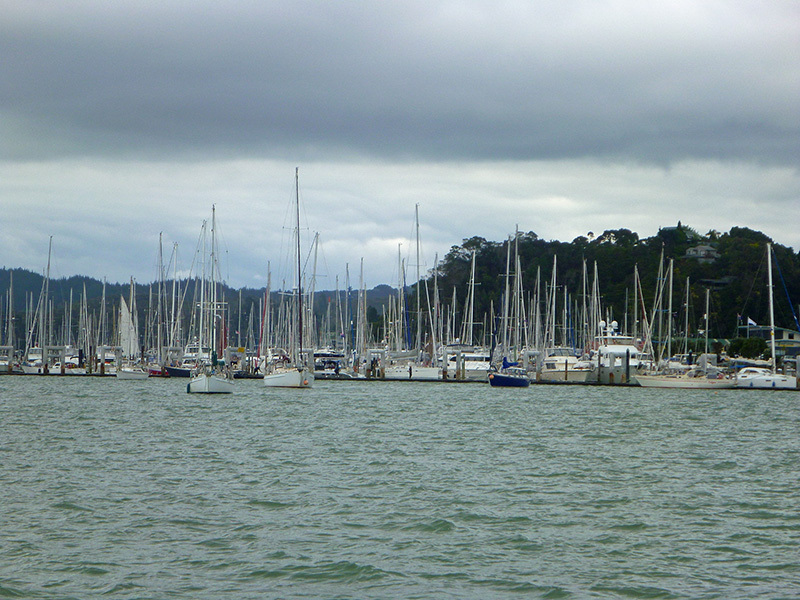 We saw some familiar vessels as well as many new boats at anchor: New Zealand is truly a boater’s paradise. The gray mist, dripping rain, and cold temperature made us feel right at home. Entering the temperate zone climate of New Zealand was like coming back to the Pacific Northwest. Silhouette at anchor in the Bay of Islands: The green, nutrient-filled water shows that we're not in the tropics anymore and are in an urban environment. 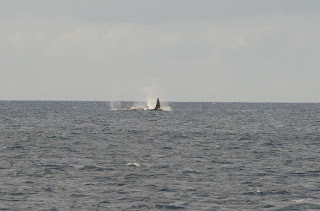 We have been away from Seattle for thirteen months, and between April and November 2012, we completed our first cruising season. Since we belatedly reset the boat odometer in Newport, Oregon (forgetting to do it before we left Seattle), we have put 11,624 miles under the keel. Now, it’s time for a little rest while Silhouette contemplates her next move. Do we have a project list in store for her? Of course we do. I feel as if we are at "intermission." Time to get up and stretch, visit the girl's room, and get some pop-corn before the show begins again! You guys are amazing. I am proud of you both! Congratulations on a safe passage! I reckon you to be about 100 miles further north than I ever got (Auckland).